10 villages protest In Thiruvarur! Sri Ramachandra Murthy December 27, 2018 12:31 IST 10 villages protest In Thiruvarur! People of ten villages near Thiruvarur unexpectedly jumped into a protest demanding repair of the national highway road. The Thanjavur - Thiruvarur - Nagapattinam national highway had been severely damaged leading to lots of accidents and losses of lives in the past few years. Hence people of the area were demanding the repair and maintenance of the roads but no action had been taken with regards to their complaint. Hence, the people of these areas suddenly jumped into a protest. 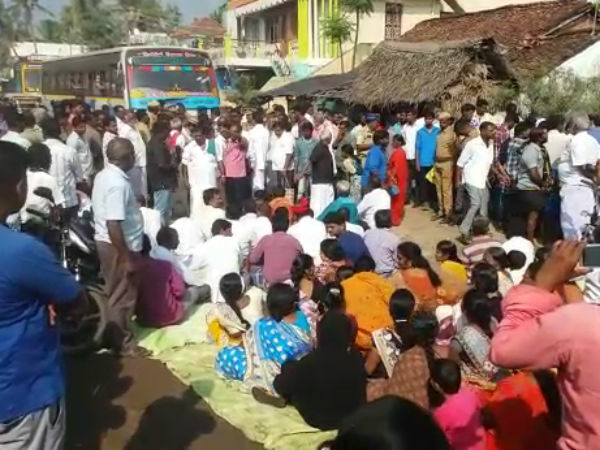 People belonging to ten villages all of a sudden blocked roads in an area named Kadaram kondan and started protesting demanding their request to be met immediately. Pazhavanakudi, Mochakudi, Kadaram kondan, Sreenivasapuram and many other area people involved in protests and blocked the roads. Due to blocking of roads, lots of vehicles are stuck in the traffic.